Figure 1. Top left: Rubies are mined in a mango orchard in Channapatna, India. Top right: This 15 kg rough ruby is from Subramaniam, in the Indian state of Karnataka. Photos by Pooja Shirole. Bottom left: This thin section of ruby is surrounded by an isotropic reaction rim. 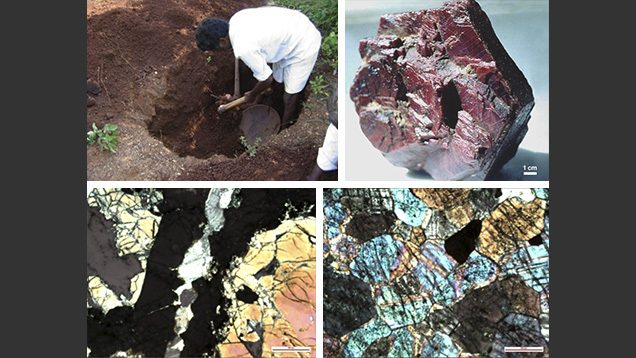 Bottom right: A corundum granulite showing ruby with blue and pink interference colors. Photomicrographs by Pooja Shirole; crossed polarizers, magnified 4×. The Karur-Kangayam and Hole-Narsipur belts, in the southern Indian states of Tamil Nadu and Karnataka, respectively, are famous throughout the subcontinent for their gemstones, including sapphire, moonstone, iolite, aquamarine, garnet, sunstone and corundum. The city of Karur itself is well known for rubies. Ruby is also found in Subramaniam (also known as Red Hills), near Madikeri in Karnataka. Channapatna (figure 1, top left), roughly 280 km (117 miles) from Madikeri, is famous for its star rubies. In all of these locations, mining is performed using primitive methods. Good-quality transparent rubies come from the Karur region, though color varies along this gemstone belt. The mines situated in Karur are located on barren land along the roadside; the nearby towns of Kangayam and Paramatti also have ruby mines. Madikeri is a remote hill station covered by lush green forests, located in the Western Ghats of India. The ruby found here is lighter, translucent to transparent, and of good quality. A ruby-bearing granulite, commonly called ruby rock, is used for making artifacts such as wands and crystal balls. In the town of Subramaniam, close to Madikeri, large hexagonal pillars of ruby are mined; deposits are also located in the nearby villages. The stones are mainly hexagonal but come in many sizes and shapes. They have a maroon color, and some show 16 mm dot inclusions of hematite. These rubies range from 20 to 100 mm across the pinacoidal face, with the length across the prism faces varying from 10 to 50 mm. Their weight ranged from 10 g to 2 kg, though specimens are as large as 15 kg, as in the top right image in figure 1. Granulite, the host rock of the Karur rubies, is somewhat similar to the host rock of Mozambique rubies (see Winter 2012 GNI, pp. 309–311). Both contain hornblende, biotite, and plagioclase. In certain areas such as Sengal and Kiranur, rubies are found in association with gem-quality iolite (cordierite). The ruby in Pamakondampalayam is found with a reaction rim of spinel, sapphirine, and cordierite (figure 1, bottom left), while the Madikeri rubies are associated with plagioclase, augite, garnet, sillimanite, and sphene in corundum granulites (figure 1, bottom right). Madikeri ruby also occurs in corundum-fuchsite-mica schists, which have a mineral assemblage of fuchsite mica, quartz, corundum, and rutile. In summary, good-quality transparent ruby comes from host rocks in Karur; tabular hexagonal crystals ranging from transparent to translucent are mined from corundum granulites in Madikeri; and opaque star-ruby is found in the mango and coconut orchard soils of Channapantna.